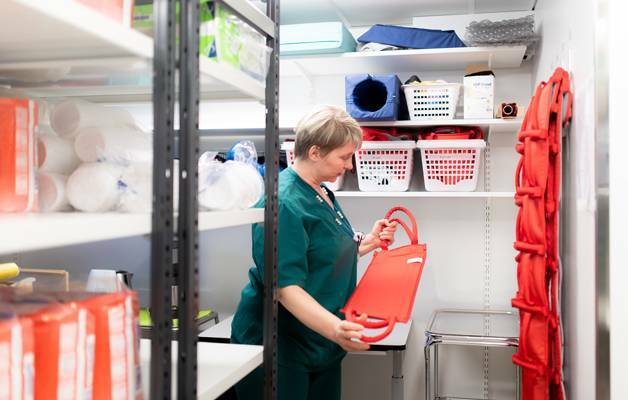 Team leader Katja Limmer is enjoying her break in the quiet room of her workplace. During a break one can relax in the massaging chair or do some stretching exercises. How do shift work, night work and overtime work affect the life of employees and supervisors? Researchers emphasize the importance of recovering and getting enough sleep. The employees and manager of Prisma supermarket at Kannelmäki tell us what working 24/7 means in practice. 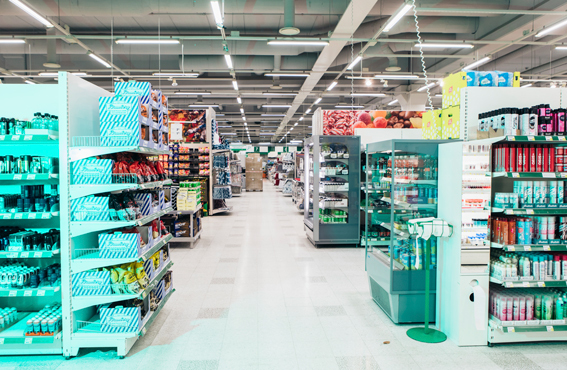 The Prisma store situated in the mall of Kaari is Finland’s biggest food market – a huge hypermarket! As the evening darkness falls outside, inside the store activities go on just like in the daytime. Employees carry on with their tasks, here and there, filling shelves, and quite a few customers keep coming in. Satu Karsikas works during the night, unloading crates and filling shelves. She is satisfied with her working hours, having worked night shifts for already 13 years. First she was a waitress at the ABC gas station cafeteria, and has now been employed for a year at Prisma. And she intends to stay there. When we walk over to the cash registers, we are met by smiling Päivi Levander, who is also satisfied with her night work. – I like the customers and I like my work. Some really wonderful people come here at night. I also like my workmates. We have a good sense of humour and working together is fun. Satu Karsikas decided to try night-shift work when her youngest child started school. This allowed her to be at home when her first-grader came home from school. – Everything worked out so smoothly that I decided to continue that way, she laughs. According to Päivi Levander, night work is just like any other work. – I have always liked to stay up quite late at night. Even though there are always some customers, there is no hectic rush hour at night. The atmosphere is more easy-going. The team leader of night workers is Katja Limmer who has worked night shifts for four years. She enjoys her work, especially because of the calm and peaceful atmosphere. She draws up the shift lists, and at home she also has a calendar where she makes plans for her own life: times for house-cleaning, preparing meals, meeting friends, and so on. – You need to put a little more effort into your private life in order to keep up friendships and take care of your marriage and family. You have to adjust your goings and doings in rhythm with the majority of family members. In recent years services have improved a lot, so taking care of practical things is no longer so complicated. You can pay your bills and take care of many other things online. 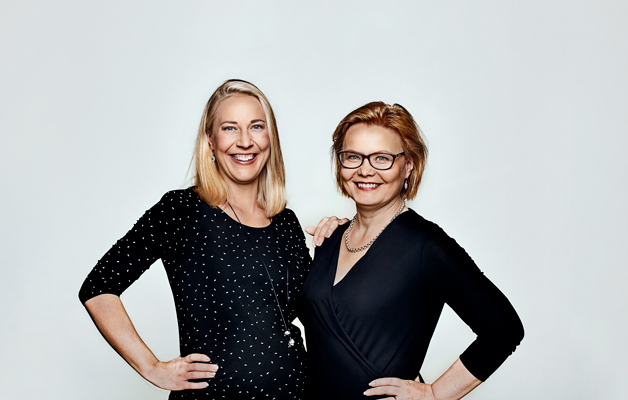 Both Päivi Levander and Satu Karsikas work night shifts on weekdays, so the week-ends are free for social activities and hobbies. – Then I call my friends and visit them. I am also an eager outdoors person. That’s where I get extra energy, says Levander. Satu Karsikas has friends who also do shift work. On free days they go dancing, they sing, they go on hikes, and she spends time with her children. Night-shift worker Satu Karsikas has always done shift work, of which 13 years only night work. Walking with her dog, having a regular daily rhythm, and wonderful workmates give her energy and make the work enjoyable. – Winter is the most difficult time from the viewpoint of coping at work. If I don’t wake up really early, a whole week may pass before I see the sun. I need 7–8 hours of sleep. A bright-light lamp and regular intake of vitamin D help. You need to be careful with what you eat. 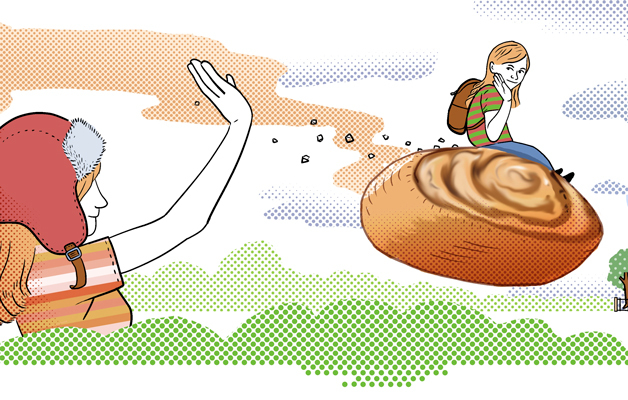 If I eat fatty and unhealthy foods, I get tired, says Katja Limmer. 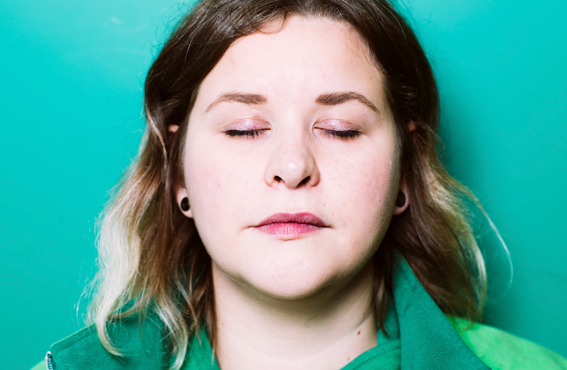 Päivi Levander works as a cashier, and coping isn’t a problem for her. She has four cats at home, and they let her sleep as long as she wants to. – When you have had enough sleep, you wake up refreshed. My sleeping rhythm works well for me. Perhaps it’s so easy because I don’t have a family. Satu Karsikas doesn’t think night work is any more strenuous than day work. – Sleep is essential. My sleeping rhythm is so regular that I haven’t had any problems. Three-shift work might be tougher, because the rhythms get mixed up. But working night shifts regularly isn’t a problem. Katja Limmer points out that the work done at night in a store is physically quite heavy on average, because you have to lift a lot of items. About 90% of the incoming loads are unloaded during the night shift. Karsikas sleeps well every day. – When I get home from my night shift, I go on a walk with my dog, then I have breakfast and go to bed. I sleep about 6–8 hours at a time. Around three or four pm I get up, go out with the dog, and then it’s time for my dinner. Before leaving for work, I have an evening snack, and during the night I have porridge at work. Levander and Limmer have a very similar eating rhythm. Levander has a light meal when she gets home from work, and then sleeps for 5–8 hours. When she wakes up she has a proper warm meal, and a cup of coffee for dessert. Also Limmer eats when she wakes up, before leaving for work, and at night a warm meal during the meal break. There are three breaks during the night shift: two coffee breaks and a half-hour meal break (without pay). The social spaces for the personnel include a room where one can withdraw for a while. There is a massaging chair, plenty of coffee, and now and then some snacks. Meetings are held at the beginning of the shift, so there is no need to come to a meeting during the day. – The employer rewards the employees: often provides all kinds of snacks during coffee breaks. We are taken good care of, the business wouldn’t run without us, summarizes Satu Karsikas. Feeling safe is important for night workers. Päivi Levander is the only one of the three women who was slightly apprehensive when starting night work. Some youngsters at first fooled around and tested to see what one could do in the store at night. Levander says that the situation has now calmed down, and no disorderly conduct is to be feared. The guards are always available, and there are a good number of night-shift workers around. 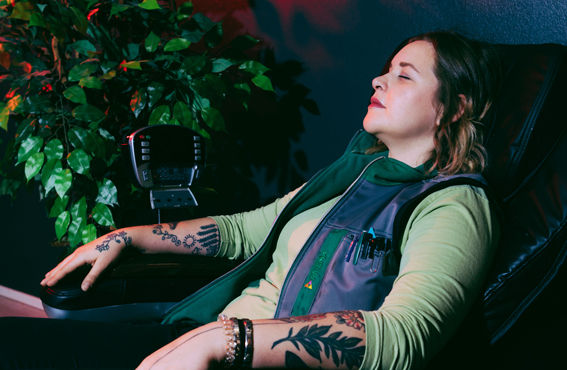 Because Satu Karsikas used to work night shifts in a restaurant, she wasn’t worried about night work at all, and she hasn’t experienced anything disturbing. Katja Limmer agrees with her. – If I sometimes happen to see a person put something into their bag, I call the guard, and usually I’m told that the person is already being observed and followed by the guard. Limmer says that it’s usually easy to find people for all the shifts. – Autumn is probably the most challenging time of year, because many people start to study or make some changes in their life. When we need extra help from staff rental firms, usually it’s even easier to get people who prefer night work rather than day work. All three women are pleased that they have received positive feed-back from many customers. 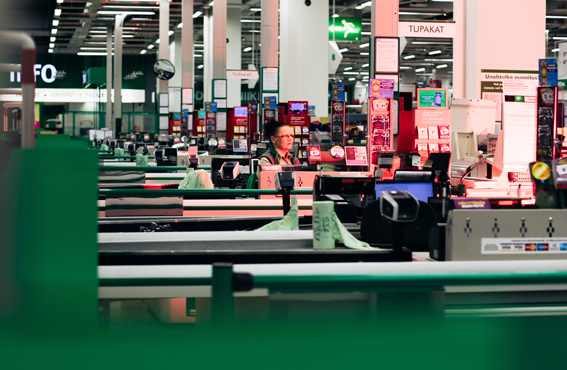 Päivi Levander sees the whole spectrum of customers at the cash counter. In her recent work shift an elderly woman had told her that it was wonderful that there wasn’t loud music in the store, and not a lot of other people. One can walk around and look for things in peace and quiet. – The arrangements needed for night work bring extra costs, but not everything can be measured in money. Being well known and offering top-quality services to customers are also important to us, says Ilkka Riiali, manager of the hypermarket. Prisma at Kannelmäki was the first hypermarket in the Nordic countries to keep its doors open 24/7, starting in March of 2017. 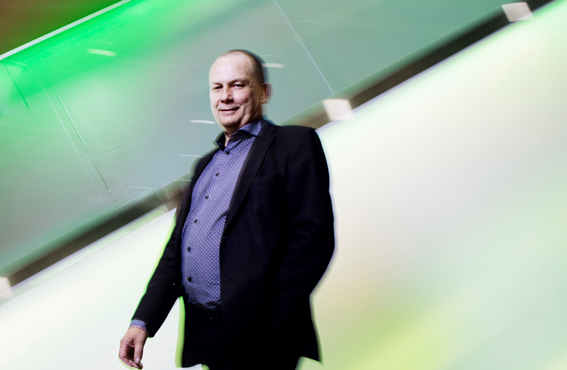 Of course the system needed to be carefully planned in advance, says manager Ilkka Riiali. – Starting all-night opening hours proceeded surprisingly smoothly, because we had spent enough time planning. We got the idea in May, and in August we started detailed planning. We went over all possible matters that might come up. In December we launched a one-month trial period. The feed-back was positive and the trial was so successful that in March we started 24/7 opening hours permanently. How the customers would behave was a big question mark. We had some knowledge of trials carried out in smaller supermarkets, but some surprises nevertheless came up. There is an abundance of details in the operations of a large hypermarket, but so far no problems have come up that we haven’t been able to solve. – Beforehand we didn’t realize that it wasn’t a good idea to leave the entire huge parking space accessible to the night-time customers. When we restricted the parking area, the maintenance of safety became much easier, says Riiali. – There is a need for many people to shop during the night. The metropolitan area is in the 24/7 mode, so why shouldn’t stores keep their doors open? It helps the life of many shift workers and people who want to stay up late. Due to their work or hobbies, many people have irregular schedules, says Ilkka Riiali. – A friend of mine mentioned that he comes here to shop even though he lives farther away. At first he came because he needed something late in the evening. Now he comes regularly because he doesn’t have to try and remember what the opening hours are. But of course the wide selection of goods is another good reason. Riiali read negative comments in newspapers at the time when all-night opening hours were first being debated. The general fear was that the employees would have to work during the night against their wishes. But this kind of writing has no longer been seen. – Night work is voluntary in our store, and nobody has to do it if they don’t want to, Riiali says. He reminds that night work was common in grocery stores even before the new opening hours came into effect. – The cleaning and refilling of shelves, unloading of deliveries, and many kinds of maintenance tasks have been carried out during the night even earlier. Many expenses, such as energy costs have therefore been running around the clock. Service manager Saara Tilander is responsible for the enterprise’s HR (human resources) matters. She points out that only volunteers are hired to work at night. During the night there are about 25 employees in the store, and the total number of employees is about 240. This means that the enterprise has enough resources to offer people the work shifts they prefer. – Our employees always have the opportunity to change from night work to day work, if they have problems in coping, or difficulties sleeping, or some other personal reasons. And of course, the other way around is possible too. If a day worker is interested in night work, this can be arranged. But it requires passing a legally stipulated examination for night work, says Tilander. According to her, night workers have various reasons why they prefer to work at night. – Surprisingly, many night workers have families. We have tried out different shift arrangements, and have found that 10 pm – 6 am is the most preferred and best functioning night-shift time. For someone having a family it’s convenient to come home from work and send the children off to school, and then go to bed yourself. At 6 am also public transportation is already available. The employees’ views were given much attention when working out the details. Even if someone has to be absent for some reason, it doesn’t disturb the operations of a big store. An employee can always be found for the shift. If some night shift can’t be patched, extra help is hired for the next day’s morning shift, so that the tasks get done. Even during the quietest hours, at least 15 employees are present, so the night work isn’t dependent on one or two persons. A scooter is handy for moving around in a big store. Cashier Päivi Levander is a dedicated night person. She likes her work, and says that the customers are wonderful. Employees who work night shifts regularly have to undergo legally stipulated health examinations. This applies to people who work at least three hours at a time between 11 pm and 6 am, over 20 shifts in a year. Periodic health examinations are carried out yearly during the first and second year of night work, and thereafter at 5-year intervals until the employee is 50 years old. Employees aged 50–60 are examined at 3-year intervals, and after that at two-year intervals as long as the person continues to do night work regularly, explains Tilander. – The occupational health service personnel record the risks of night work carefully. They interview the night workers and follow up their health status and work ability regularly. In other respects, the well-being of the night workers is looked after in the same way as that of day workers. The same services and support protocols are available to them. – When planning shift lists, we try to make sure that the rhythm of the night workers is not broken. They have a regular sleep rhythm, so we try to preserve it. They are entitled to the same established practices and benefits as all our employees. These are, for instance, the model of early intervention and support, work assessment discussions between the employee and supervisor, team meetings, information sessions concerning profitability, as well as briefings explaining the results of their work community surveys. – All the employees, regardless of their shifts, are treated equally, assures Riiali. 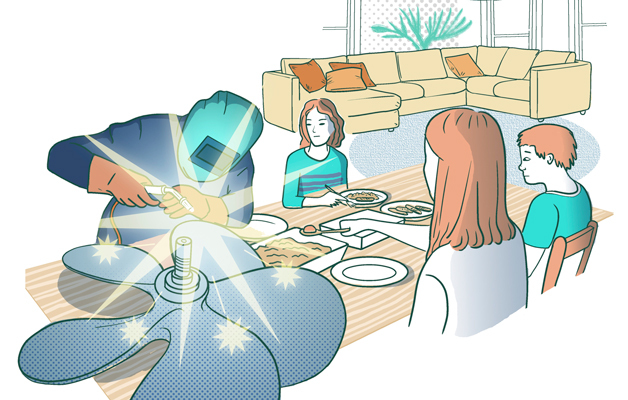 If, for instance, the employees are rewarded for their good performance by organizing a special luncheon for them, the night workers can enjoy the luncheon during their night shift. Also all information sessions are organized during the night for them. Safety during the night is maintained on at least the same level, in proportion to the number of customers, as in the daytime. Guards must always be available in the supermarket. Riiala says that no big problems in regard to safety have been encountered. During the night there is less staff around, but the guards can be summoned very quickly. There have been very few disturbances. 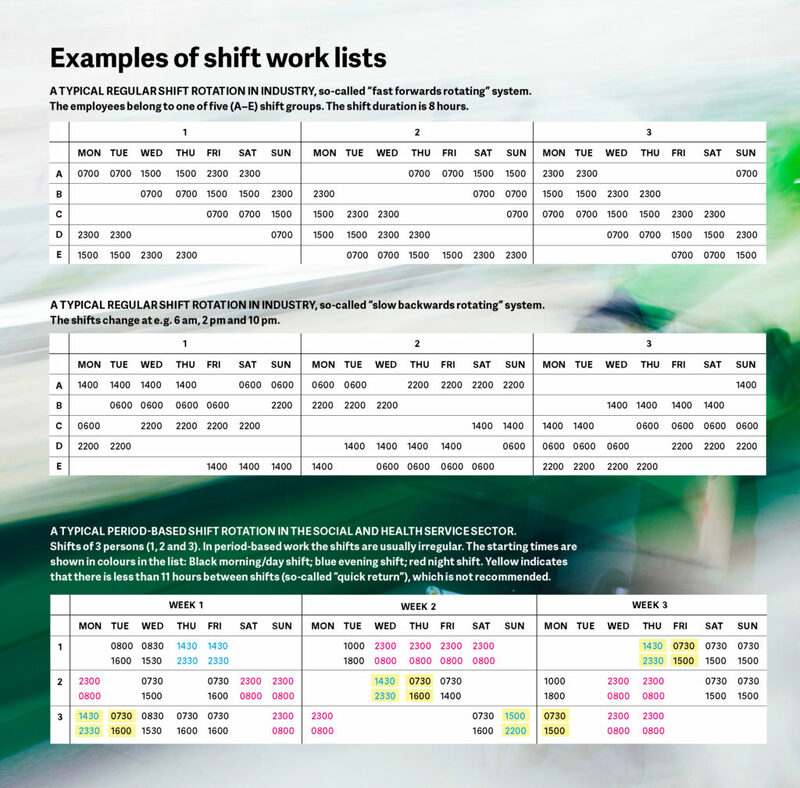 Examples of shift work lists. Click for larger image. Working times have a comprehensive impact on the employees’ well-being and work ability. 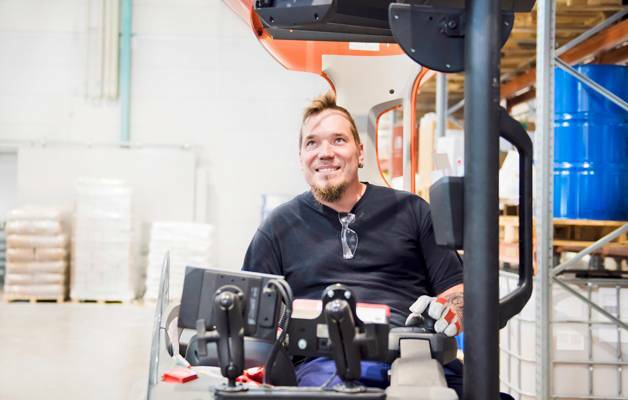 The research by the Finnish Institute of Occupational Health has shown that especially shift work and night work are very loading physically, mentally and socially. Research professor Mikko Härmä from the Institute has studied and developed aspects related to working hours for over thirty years. He nevertheless gives hope to shift workers. According to him, the hazards of shift work can be lessened by good shift planning. – There are two kinds of shift work: traditional regular shift work mainly in industry, and so-called period-based work. The working times in period-based work are mostly irregular, and shift lists are prepared only two or three weeks in advance. In industry, on the other hand, the work shifts for instance in paper mills are known perhaps even a year in advance. The shift work in industry can be interrupted, so that the week-ends are free, or it can be uninterrupted, meaning that the work is done in shifts around the clock all week, in other words, 24/7. The work shifts are thus spread evenly every day throughout the week. The most typical way is to have 8-hour morning, evening, and night shifts, but also 12-hour day and night shifts are used increasingly. In period-based work, however, the lengths of the work shifts vary. Shift work can also be done in two shifts, morning and evening shifts. In some lines of work the week-ends are free for everybody; this is so-called interrupted shift work. But then on week days the working hours may be at any time of the day or night. 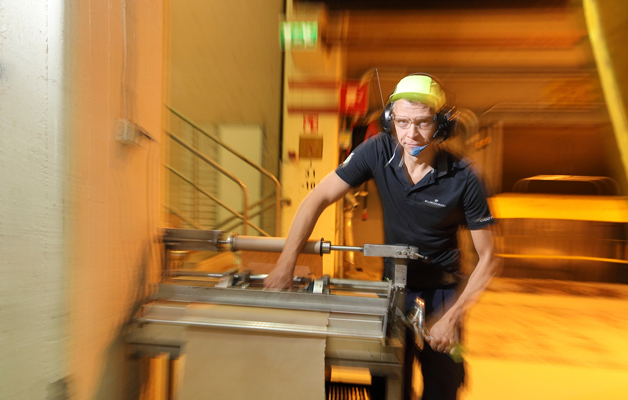 – Week-ends without work are a good solution from the viewpoint of the work and the employee’s own life, Härmä says. A very demanding form of shift work is period-based work for which the lists are prepared only two to three weeks in advance. Period-based work is stressing for employees, because they see their work shifts only a short while in advance and cannot anticipate their future working times. This makes it difficult for a person to organize and plan their own life. Often, however, the employees can express their own wishes regarding the shift list. – In addition to this, the Working Hours Act allows more flexibility for period-based work arrangements, so that not only shorter shift lists are possible, but also shorter intervals between shifts and longer shifts are permissible. There may be only 9 hours between shifts, while in other shift work the intervals have to be at least 11 hours. In period-based work, the length of individual work shifts or the length of the work week are not regulated, Härmä lists. If a person’s commuting to work takes over an hour, not enough time is left for rest and other necessary activities between the shifts. And if a person works several shifts like this in succession, fatigue accumulates and a return to one’s normal sleep rhythm is more difficult. Recent research has shown that in these cases sickness absences and the risk of accidents increase. Period-based shift work is typical in the social and health care sector. The Working Hours Act defines the branches of activity where period-based work can be done. Other branches are for instance professional transport and the hotel and restaurant sectors. A new Working Hours Act is in preparation and is waiting for parliamentary procedure. The new Act is extending the employers’ rights for applying period-based work. For instance, security jobs, telecommunications work, and fire and rescue work would fall within the scope of this right. The Finnish Institute of Occupational Health has issued a statement by Mikko Härmä, which does not recommend extending the right to allow period-based work. Evening work, week-end work, and over 40-hour work weeks have been found to be most harmful for balancing work and private life. Research shows that prolonged shift work unfortunately increases the risk of getting cancer, cardiovascular diseases, and to some extent the risk for depression. A recent study has shown that accident risk is 36% greater in shift work than in day work, and short shift intervals even increase the risk. Katja Limmer emphasizes the importance of a healthy diet and sufficient rest, vital for coping in night work. In winter, a bright-light lamp and vitamin D give extra energy. What kind of shift work would be optimal in the light of the latest research? Härmä says that there is no standard solution that suits all lines of work. The recommended work rhythm depends greatly on the line of activity. – Our studies emphasize the finding that fewer night shifts and fewer shift intervals of less than 11 hours, and fast forward rotating shift models with only two night shifts in a row, increase alertness in period-based work as well as in industrial shift work. The positive effects are most pronounced in older people. Several successive night shifts, however, shorten the length of sleep, especially in older persons. In the studies of the Finnish Institute of Occupational Health, fewer short shift intervals, or starting to work only day shifts, clearly reduced the tiredness of especially older employees. – Good planning can therefore significantly lower the risks related to shift work, emphasizes Mikko Härmä. – It is important that the person drawing up shift schedules utilizes knowledge about the effects of the different aspects of shift work on stressful loading. The best shift planning programs analyse the shift list that is being prepared, and also offer clear recommendations regarding loading. 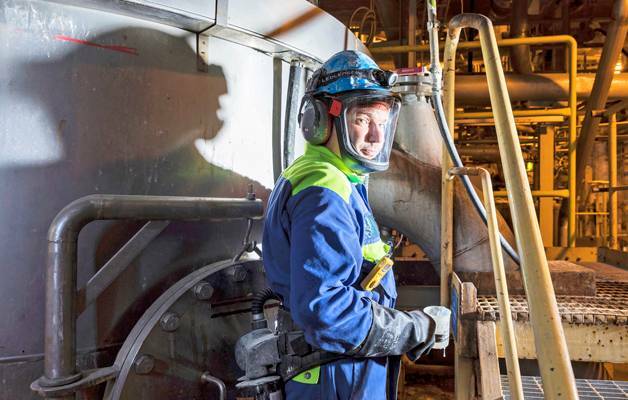 The Finnish Institute of Occupational Health, in collaboration with CGI Finland (Consultants to Government of Industry), has proposed recommendations related to the loading of shift work to be taken into consideration in the planning of work shifts. The Titania® shift planning program, used in the social and health care sector, contains the recommendations of the Finnish Institute of Occupational Health for good shift planning, tools for employees to present their wishes regarding shifts, as well as warning signs, in case the shift schedule threatens to become too strenuous. – Although there are many kinds of shift systems, and different lines of work apply different systems, shift lists can always be improved in all branches of activity. In this way, the employees’ well-being can be improved and fatigue can be reduced. 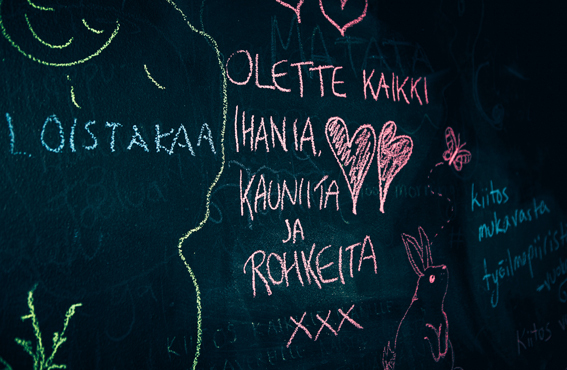 This promotes work output and simultaneously lowers the number of sickness absences and accidents, summarizes Härmä. After the first night shifts, have your day sleep at a later time or divide it into two parts. Take a nap as close as possible to the start of the night shift. After the night shift ends expose yourself to sunlight on the way home (if possible), and go to bed as soon as possible. Start your sleep phase earlier. Use a bright-light lamp in the mornings, or walk outside in the morning sun. Avoid over 20-minute naps after the work shift. Take a nap before the night shift, and after the night shift go to bed as soon as possible. Have your main meal near the beginning of the work shift. Have small but versatile meals. Eat healthy foods, prefer roughage (fibres) and plant fats; fruits and nuts are handy snacks. Avoid foods containing fat, salt and cholesterol, because they make you tired and make you gain weight. Drinks containing caffeine stimulate, but avoid plentiful use of caffeine near the end of your shift. Remember that overcoming tiredness with caffeine is just a temporary solution, and does not eliminate the need for sufficient sleep. Drink also other liquids, not just coffee, because a sufficient amount of liquid is important. Cold drinks or light snacks can be helpful. Physical exercise improves the length and quality of sleep and alleviates stress. Take your work shifts into account in the timing of exercise: exercise (walk, jog, gym, etc.) after morning and day shifts, but avoid exercise just before a night shift. If you exercise between night shifts, take a nap before the beginning of your next night shift. Avoid heavy exercise two to three hours before going to bed: the body needs time to calm down after physical exertion. Before beginning your first night shift, take a nap of 1–2 hours. If you can, take a short nap during the break in your night shift (10–20 min is enough). Rotating work tasks and variation during the work shift helps you stay alert. If possible, some auxiliary activity is helpful: listening to the radio or chatting with a workmate. Predicted sales for this year about 145 million euros, the share of the grocery store being over 100 million euros. 2 million paying customers per year, 80,000 per week. Finland’s biggest online food store: 250–300 deliveries on best days. Own personnel about 240, of whom over a half full-time, the rest working 15–30 h per week. Extra hired help is used when needed for seasonal variation. Always 1–5 in a row, after which at least 2 free days. One shift lasts 8 hours (10 pm – 6 am). Some employees also work night shifts randomly; also they get 2 free days after the night shifts. All other employees work in morning and evening shifts. 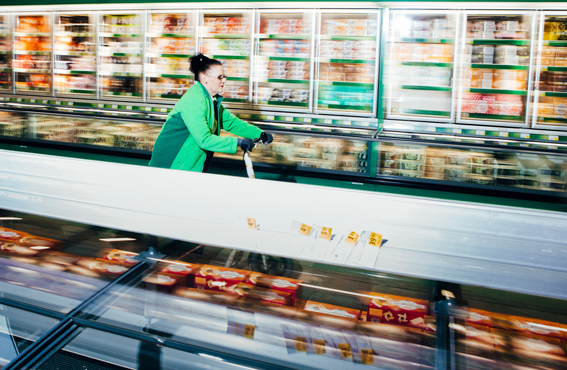 The work shifts in the consumer items and grocery departments range mainly from 6 am–2 pm, 2 pm–10 pm and 11 am–7 pm.